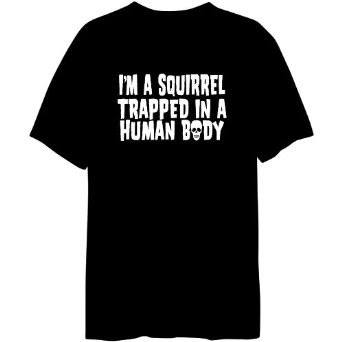 This funny squirrel shirt reads "I'm a squirrel trapped in a human body." It's available as men's tshirts and as men's sweatshirts. 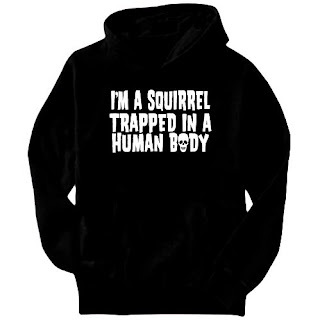 Similar to the blue, barbed wire version of the "I'm a squirrel trapped in a human body", this black t-shirt and hoodie also convey an important message to the people in the vicinity of the shirt's wearer. What message? That you are but a hyperactive, bushy-tailed rodent, trapped in a strange human body. Depending on your individual style preferences (skull, or barbed wire), you will have to make the hard decision of which of these shirts is best for you.